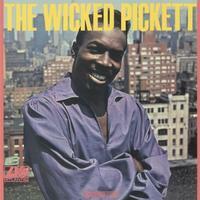 180-gram pressing featuring "Mustang Sally," "Sunny," and "Knock On Wood"
Wicked Pickett (1966) is a fabulous soul album, done when Pickett was in the midst of his best period at Atlantic. The album has everything — great songs, wonderful production and arrangements, and a hungry, galvanizing Wilson Pickett hollering, screaming, shouting, and soaring on anything he covered, from ballads to uptempo dance and midtempo wailers. Containing the hits "Mustang Sally," "Sunny," Dan Penn's "You Left The Water Running," and the classic "Knock On Wood," this is a must have album for everyone with a craving for soul, soul, and more soul!